May I ask is this a mole or melanoma? Disclaimer...pretty much impossible for anyone here to look at one picture of a brown spot with no other information and give you a even semi decent guess if it is "suspicious". When you go to a dermatologist they will look at it and if they are concerned will take a Biopsy. It looks Like a brown spot...could be a mole and old age spot (liver spot) or something else. Melanoma? usually one of the indicators is a mole that you've had a long time that is changing growing / irregular edges. Or a spot that did not exist that came up and seems to be growing or acting weird. You know your body better than anyone else..If you think it is a strange get to a dermatologist right away. The skin cancers and alternative treatments we discuss here are all "Non-Melanoma" Melanoma is the killer so it's not the kind of skin cancer you can mess around with, wait around on, to get taken care of.. If it's been changing or just popped up out of nowhere and you are concerned..don't gamble with it..get it looked at by a dermatologist ASAP. I concur with the view of anivoc. 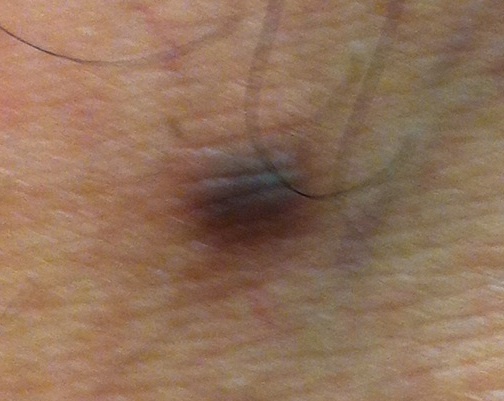 You may consider doing your own self diagnosis if there is an indication that this is not just a benign nevus. Nonetheless, you would have to consult your dermatologist to confirm whether it is a melanoma or not. Just a small update, I have removed it last week. There will be followup on 20th June 2013 to see the medical report.